True worship never leaves the worshipper unchanged. To behold glory is to be transformed by it. An encounter with God in his Word will certainly lead to responses of adoration, thanksgiving and confession, but it will necessarily lead to prayers of consecration and supplication as well. As we agree with God regarding what we need to put off, we agree with God regarding what we need to put on (Col 4:22-24). We pray prayers of dedication, commitment, consecrating ourselves to consciously please God in word, thought and deed. Our meditations drift from God’s Word to his world, and with them, our problems. New Age proponents enjoy the term “centering”, by which they mean a kind of meditative state of focusing energies back to the center of one’s body. Though Christians reject these techniques, we do want to use private worship to recall the loose ends of our lives, the disarrayed priorities, the scattered and perhaps dissipating efforts around the center of loving God. A sense of restlessness pervades our lives, for we never completely ‘keep up’, finish the to-do list, or arrange all things perfectly neatly. In fact, much of our battle with distractions in prayer and meditations come from the intrusions of our worries, anxieties, burdens, pressing duties, or unsolved problems. Trying to swat these away is usually fruitless. We would do well to simply draw them into our worship, consecrating them to God, turning them into prayers of consecration, casting our cares upon him, for he cares for us. As we return our thoughts to the Word, an interrogative meditation on Scripture will ask these kinds of response questions: What change does the Spirit desire as a result of our reading this? What new thoughts should we think? What new affections should we have? What new behaviour must we practise? What must stop and what must begin? 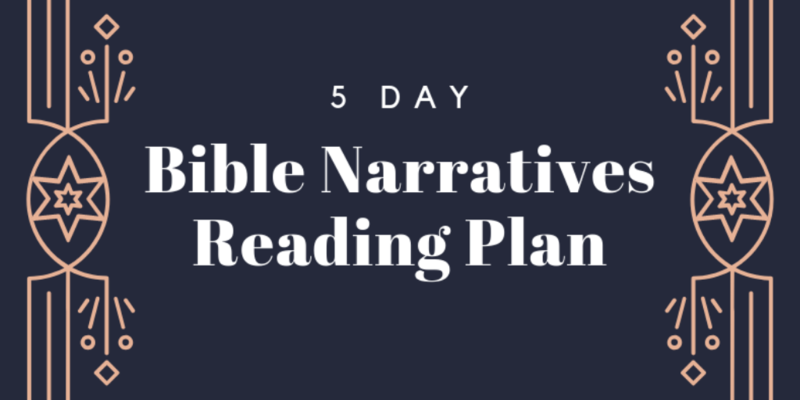 Writing out areas of change that need to take place, or setting ourselves some kind of resolutions as Jonathan Edwards did, prevents us from being the man who uses a mirror to no effect. If we have reverently interrogated the Scriptures, some responses of submission to God should be clear to us. If we have presented our lives to God, we will have consecrated our worries and burdens to him, submitting to his Word and his ways as the means of handling and solving them. Conformed speaks of a change that lasts. If the posture of submission is truly present, we will want to retain what we have seen of God’s glory. Scripture in more than one place charges God’s people of being guilty of forgetfulness, which is really a form of passive rebellion. What we love and commit to, we recall. If we have indeed consecrated ourselves to please God by obeying his commands, then we should take steps to “bind them as a sign on our hands, and as frontlets between our eyes.” (Deuteronomy 6:8) We need to memorise the Word of God, and no time is better than private worship. If the cross-like postures of humility and confession have truly been present in us and the resurrection-like postures of seeking and submission have led us to zealously commune with God, embrace conviction, and consecrate ourselves, we will want to give ourselves wholly to obedience, until the change in one’s life becomes visible to others (1 Tim 4:15). Whatever tools assist us to memorize, we should use them. Conformity to Christ climaxes in love: a deeper love for God, a love for what God loves, and a love for others. If we have been confronted with God’s beauty, and prayed prayers of adoration, thanksgiving, confession, consecration, and supplication, we have come full cycle to a deeper love for Christ. From this place, we should have a deeper love for our neighbour. Prayers of intercession go up, as we love our families, Christian brothers and sisters, unbelieving neighbours, and even our enemies. The First Commandment always spills over into the Second. We are not seeking to place an artificial chronology upon prayer. To read the psalmists’ prayers is to read prayers that freely mingle adoration, thanksgiving, supplication, imprecation, intercession and confession. Describing the different possible responses to God does not mean they need to be artificially separated, though we must of necessity treat them separately here. 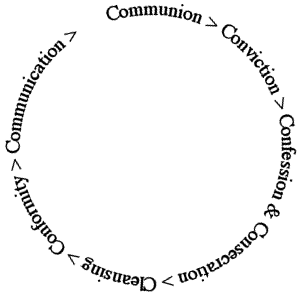 This is why we have illustrated the Christian life as a circular process, and not as a linear series of events. During the Word and prayer, if we are maintaining the postures of death and resurrection, the Spirit’s work of illumination will lead to conviction, cleansing, and will culminate in more communication of Christ. During this time, we trust him more, grow in deeper commitment, and grow in delight. We love him. This happens continually, and almost simultaneously, as we choose to not break the communion, but to maintain it with the posture of faith. When communion with the Triune God in private worship becomes regular, with our rising up and laying down, we shall certainly grow to love our God and reflect his beauty.